← Should Employers Conduct Employee Surveys? 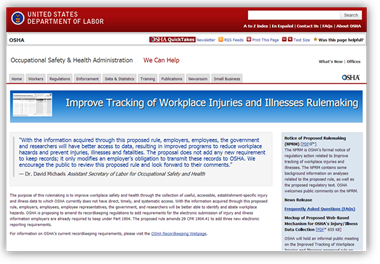 Will OSHA’s Proposal To Publicize More Employer Injury Data Improve Safety? OSHA has announced a proposed rule which will require establishments with 20 or more employees, in certain industries with high injury and illness rates, to electronically submit their summary of work related injuries and illnesses to OSHA every year. The change may affect between 450,000 and 1,500,000 sites. Currently, OSHA uses a list of 160,000 employers to require approximately 80,000 employers per year to submit data as part of its OSHA Data Initiative (ODI). The Department of Labor’s Bureau of Labor Statistics (BLS) approaches approximately 250,000 sites per year as part of its Summary Of Occupational Injuries and Illnesses (SOII). OSHA uses its data to target certain industries or establishments for inspections and other initiatives. One can see many ways in which OSHA could use more data for more effective targeting. The biggest concern seems to be how others would use this data, which OSHA would make accessible to the public. On first blush, one could argue that there is no downside to sharing individual employers’ injury and illness summaries. If properly handled, no “identifiable” embarrassing individual employee information would be available. However, let’s consider the full implications of this proposal, or more adequately, let’s consider how this initiative could be abused. OSHA press releases emphasize that the data collection would allow OSHA to better target inspection efforts and would highlight employers with especially strong commitment to safety. However, since a November 2010 conference where Dr. Michaels, Assistant Secretary, OSHA, stated that, “we will continue to practice regulation by shaming,” this Administration has championed such an approach. These are the same people who have gutted OSHA consultation efforts and shown lackluster interest in OSHA’s showcase cooperative effort, the Voluntary Protection Program (VPP). It seems unlikely that a significant reason for the initiative is to highlight good employer performance. At least, that’s not how the Administration has worked so far. One also has to ask the extent to which this expansion is driven at the request of unions and third parties who want access to such data in order to attack specific employers. As an example, consider the 10-year campaign against Hyatt by the union, UNITE-HERE. UNITE-HERE created its “Hyatt Hurts” campaign in order to compel Hyatt to recognize the union at non-union facilities or to give in to collective bargaining demands at other sites. The union focused on injuries associated with housekeepers. The union was involved in studies which purported to show that the hospitality industry, and Hyatt in particular, required housekeepers to change too many beds per shift, which contributed to ergonomic industries. (This Job Hurts!) The union was then involved in persuading OSHA to investigate dozens of alleged instances of ergonomic violations throughout the country. Dr. Michaels, actually took the extraordinary step of writing a highly publicized Hazard Alert letter to Hyatt criticizing their practices. The campaign finally cooled after the union shifted its attention to opposing the nomination of Hyatt principal and former Obama fundraiser, Penny Pritzker for Secretary of Commerce. Hyatt supposedly changed its position and the nomination moved forward. How did the union and the research groups obtain Hyatt-specific information which purported to show that Hyatt workers suffered disproportionately from ergonomic injuries? The data was not available on a government site. Rather, the union used existing OSHA provisions allowing employees, former employees, and their “representatives” to obtain extensive injury and illness data. They then fed this data to groups for analysis and arguably for manipulation. We don’t know how much merit the union’s claims possessed, but the tactics often employed by the union seemed designed to cause the maximum pain possible, and one has difficulty seeing how the campaign benefited Hyatt or its workers. Hyatt is just one example. Consider the increase of public attacks on large international retailers for a host of alleged safety hazards. Again, we’ll not comment on the allegations, but almost all of the attacks are against “non union” employers, which raises questions about their purpose. On one hand, we can see the value of establishing a better database for OSHA to use in determining where to focus its limited enforcement resources. However, one must ask whether this arguable increase in efficiency outweighs the potential anti-competitive mischief presented by the easy assets to previously private data. Will OSHA be further pulled from its core safety enforcement duties? Some recent OSHA actions raise questions about the reasons for OSHA’s priorities, such as the divisive February 2013 Interpretation in which OSHA changed 40 years of precedent to propose that community organizers, union personnel at companies where they were not the certified bargaining agents, and other third parties could participate in OSHA inspections. How is OSHA’s mission facilitated by taking action which guarantees intrusions by third parties which will generate conflict and warrants; activities which further eat away at OSHA’s limited resources? And yet, OSHA’s ODI expansion will focus even more attention on these numbers and distract employers focus from preventive actions. The public will have 90 days, through Feb. 6, 2014, to submit written comments on the proposed rule. On Jan. 9, 2014, OSHA will hold a public meeting on the proposed rule in Washington, D.C. A Federal Register notice announcing the public meeting will be published shortly. We suggest that you consider this subject and act accordingly. We should support efforts which improve worker safety. The question is whether this proposal would improve worker safety or be used to create distractions from real safety issues. You decide. This entry was posted in hospitality, OSHA, recordkeeping, Washington and tagged corporate campaign, osha proposal to publicize employer injury data, will osha's proposal to publicize more injury data help safety?, will third parties abuse employer safety information?. Bookmark the permalink.